pivotal role in several key moments of the Chinese revolution. By 1898 he possessed large personal influence, having been placed in charge of the regime’s first modern army (the Beiyang Army) – Shikai turned this army into the most disciplined and well-trained of China’s troops, and instilled a strong sense of loyalty to him in its soldiers. The Qing regime therefore needed Shikai and trusted him as an adviser. He played a key role in the suppression of the Hundred Days’ Reform, aiding Empress Cixi’s coup against the Guanxu Emperor, but in 1901 refused to aid the Boxer armies endorsed by Empress Cixi, not wanting to engage in an uneven war with the foreign troops. Following the Boxer Uprising, Shikai gained several other government positions, such as being appointed governor of Zhili. When the 1911 revolution erupted, he was one of the most powerful men in China – gaining his support was crucial for the revolutionaries’ success. Although in early November Shikai accepted the prime ministerial position offered to him by the Qing and recaptured revolutionary-held cities in Hubei province, by late December he had been persuaded into supporting the revolutionaries, at the promise of being given presidency once the republic was established. 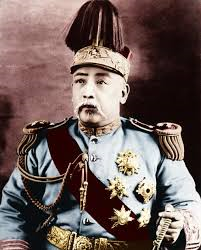 In late January 1912 officers of the Beiyang Army demanded the emperor abdicate, at Shikai’s instruction, and, having no choice, the regent did so on February 12. Yuan, a non-repulican at heart, had thus become the President of a republican Chinese state. His rule slowly deteriorated into a rehashing of Qing imperialism as Shikai repressed political parties such as the KMT, alienating those who believed in China’s republican future. As Shikai disabled the democratic organs of the new government and increasingly came to rely on repression, his rule laid the basis for the political havoc of the warlord era that was to break out after his death in 1916.